Healthy food choices: Start by choosing foods that have low-fat and low-sugar and high-fiber (vegetables & fruits). Control the portion size i.e. eat the right amount. Eat regularly: Avoid huge meals once or twice in a day. Always have smaller and more frequent meals and planned snacks in between the meals to keep your blood sugar at an even level. Exercise regularly: You should do aerobic exercises regularly. You should always discuss this with your doctor to know what type of exercise works best for you. Check your blood glucose regularly: Checking blood glucose regularly to know the changes you have to make in your diet, exercise and medications. Always check your blood sugar before going to bed to avoid hypoglycemia while asleep. Take your medications regularly: You should take only those medications that have been prescribed for you only, and in the doses and frequency prescribed for you. Have regular medical check-ups: Always consult your diabetologist regularly for adjustment of doses of medications. 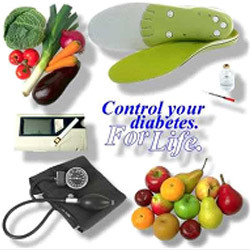 Also for screening and early detection of complications of diabetes. Stay informed: Always try to be aware of new treatments for type 2 diabetes. Don't hesitate to ask your doctor if these new medications would help you or not. Search websites, question your health care providers, read books and magazines and attend local classes or a support group. Get help for depression: Depression and diabetes often go hand in hand and struggling with blue moods can make it difficult to care for your health. A recent study has found that treating both the conditions helped patients in having normal blood sugar levels. If you feel overwhelmed by your diabetes care, talk about your feelings to your doctor. Prevent sores. One of the problems that affect many people with type2 diabetes is sores on the feet, which can develop into such severe wounds that sometimes amputation of the foot is needed. So always inspect your feet daily for blisters, cuts and sores. If you have any such problem with your feet, speak with your doctor immediately. Educate family and friends: It's always good to educate your family and close friends about your disease so that they can help you manage your diabetes better. If your loved ones know how to recognize the signs of high or low blood glucose levels, a potential tragedy may be avoided. Don't let shame put your health at risk. 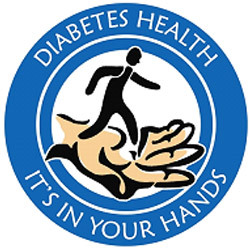 Identify yourself: Always carry an identification card or wear a medical alert bracelet that tells people you have diabetes. These will speak for you if you're in a crisis and can't speak for yourself. Feel proud about handling your diabetes in addition to your life: You won't get a medal for managing diabetes, but you certainly deserve one. Avoid smoking and keep a control on alcohol. Adopt Healthy Lifestyle: Small Changes can get you Big Results e.g. losing just 5% - 10% of your total bodyweight can help you lower your blood sugar considerably, as well as lower your blood pressure and cholesterol levels. It's not too late to make a positive change, even if you've already having advanced diabetes. Don't get disheartened, you have more control over your health than you think. Take Artificial sweeteners in moderation. AWARENESS IS THE ONLY CURE FOR DIABETES !